Two years ago my wife and I had the pleasure of living in Stockholm Sweden for 6 months. We were there for Valentine’s Day and that day reminded me of this year’s Valentine’s Day here in the States. Of course, much like today, it was snowing and cold, yet beautiful and really, how winter is supposed to be. In honor of Team USA men’s hockey team beating Russia today 3-2 I will have a hockey related post. 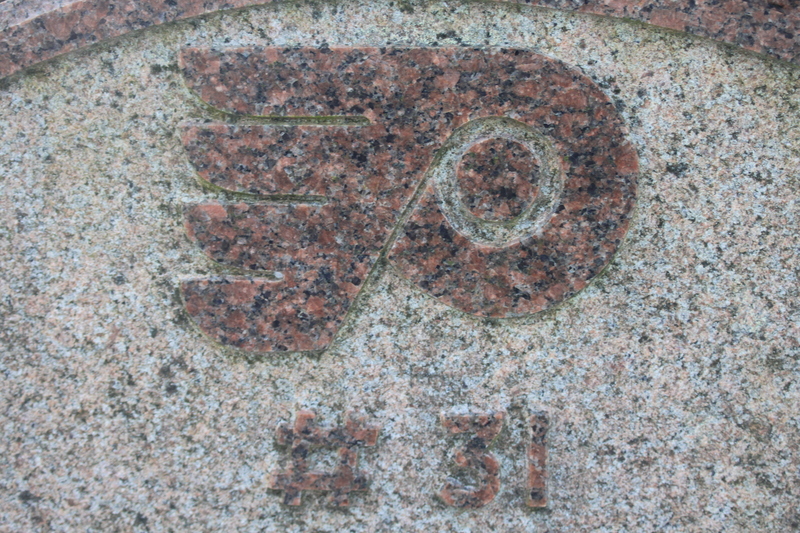 Many of you know of my passion for Philadelphia Flyers hockey. 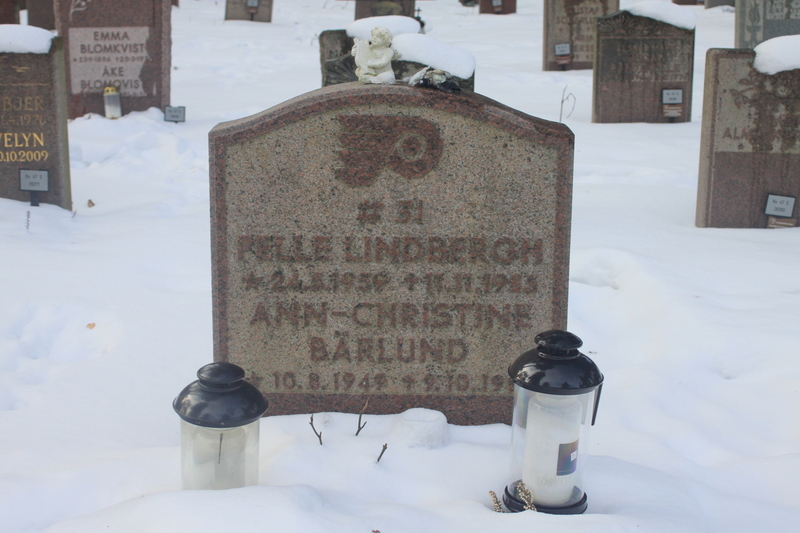 Some of you know the name Pelle Lindbergh, the tremendous Flyers goalie from Sweden who died in a car crash on 9 November, 1985. When my wife and I decided to live in Sweden I knew I would have a chance to pay my respects to Pelle. Before leaving the States, I did some research to learn where Pelle’s grave site was. I discovered and visited the St. Katarina kyrka, a beautiful, light yellow church in Sodermalm, Stockholm, where a memorial was held that all the Flyers attended. The original building was constructed from 1656–1695. It has been rebuilt twice after being destroyed by fires, the second time during the 1990s. 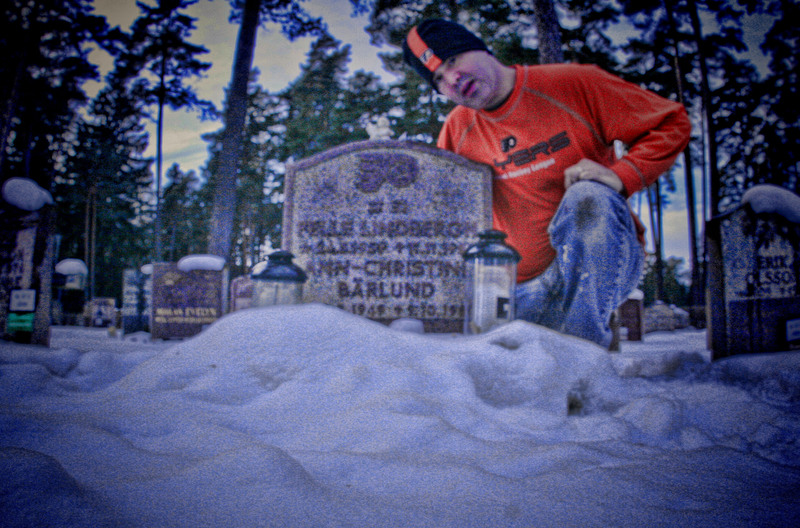 Next, on Valentine’s Day 2012, I visited the incredibly beautiful cemetery he was buried in on the outskirts of Stockholm. 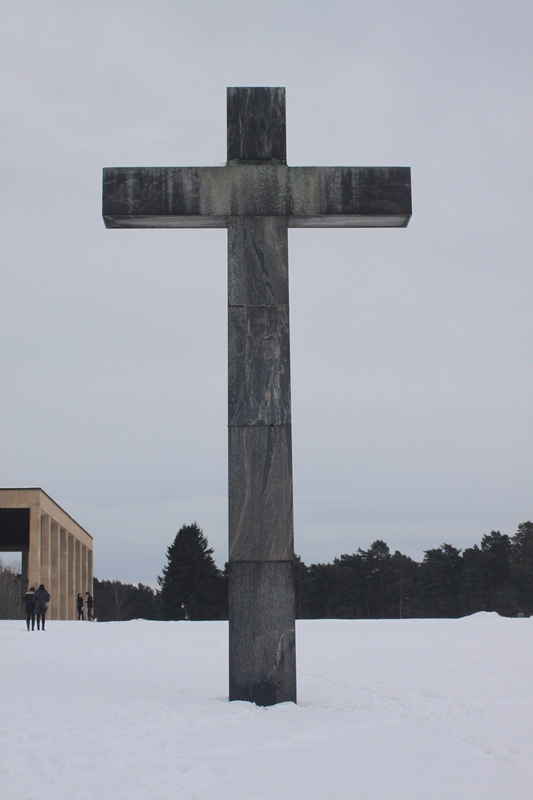 The name of the cemetery is Skogskyrkogården and it is a UNESCO World Heritage Site. Inside it’s grounds contains a pastoral landscape, complete with a large pond and a tree-lined meditation hill, a a dense grove of tall pine trees and a massive dark granite cross at the focus of the vista. To get to this pristine cemetery I took the subway out of the city center for about 40 minutes south. Upon arrival at the site i was amazed at how large it was, especially since it was covered in blanket of snow. I eventually found my way to the groundskeepers office. There I talked with a friendly man about locating the exact location of Pelle’s grave and how to get there through the forest. Today, in the aforementioned Olympic hockey game, the Russian goaltender was Sergei Bobrovsky, who played for the Flyers for a year and a half before being foolishly traded to Columbus. The very first time I saw him play, he instantly reminded me of Pelle Lindbergh and I knew we had FINALLY found our goaltender of the future. This was his first game as a pro mind you, and was in Pittsburgh, against the rival Penguins in the season opener. Plus, the game was the very first one to be played in that brand new stadium. Talk about pressure. Of course, the Flyers won that game. He was tremendous again today in a pressure filled shootout loss. Just last year he was named the Vezina Trophy winner as the league’s best goalie…. Pelle was the goalie for Team Sweden in the 1980 Olympics and played against Team USA in a 2-2 tie. After being drafted by the Flyers in 1979. He led the NHL with 40 victories during the 1984–85 season and won the Vezina Trophy, the first European goaltender to do so in NHL history. Later that year they reached the Stanley Cup Finals against the dynasty team from Edmonton, the Oilers, featuring some of the greatest players to ever play the game….. In the fading Valentine’s Day light, I reached Pelle’s grave site and was able to spend several minutes there before heading back to the city to have dinner with my lovely wife. Amazed at my surroundings, I remembered all the good times Pelle gave me and the Flyers. I recall tailgating in the parking lot of the infamous Spectrum before one of the hundreds of Flyers games I have been to next to Pelle’s Porsche his rookie year; The Flyers incredible trip to the Cup Finals in ’84-’85 and then that cold night at Hawk Mountain when I listened on the radio to the last game the Flyers would play before he died against Boston. Pelle had the night off. Late that night, beside a dwindling camp fire, we heard the news on the radio that Pelle was in an accident. It suddenly got a lot colder…..
Today, the Flyers seemed to have found a goalie of the future in Steve Mason. You never quite know how good goalies will be, it seems, until they are gone. With Pelle, you knew….